1. School names generally fall into five categories: Geography (Valleyview, West Morris); Famous Historical Figures (Dr. Sally K. Ride Elementary, Polk High); Not Famous Historical Figures (Amos W. Harrison Elementary); Numbers (PS 31); and Feel-Good Words (Liberty High, Rolling Hills School). But you’ve just been appointed to a school-renaming committee, and the task is simple—rename your school for a favorite teacher. Could be a high school, middle school, elementary school, daycare, whatever. What did he or she do to deserve this honor? A few teachers come to mind, but I’m going to go back to my undergrad at K-State and choose “Crocodile” Bob Linder. 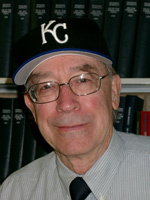 Just for fun, as an elective, I took History of Baseball and History of Christianity from him. He knew how to teach, how to peak your interest in a subject, and has lived an amazing life (the nickname comes from having wrestled a crocodile). I definitely owe a large portion of my love of baseball and appreciation of history to him. When I was in seminary I was reading my History of Christianity text and noticed an article in it by him. I flipped back to the front and it turned out he was the general editor of the book. 2. Many enjoyable magazines have folded in recent years. If you could see one magazine revived, which one would you choose? Magazines… not ringing a bell. Can I get that for my Nook? 3. What’s the best movie you’ve seen so far this year? It need not be a 2011 release. Exit Through the Gift Shop. Absolutely loved that film. The next night I was at an event at the Nelson-Atkins Museum of Art, and listened to someone explain their version of the point of the film… that anyone can be an artist if they just try. Wow, sort of missed that one, eh?